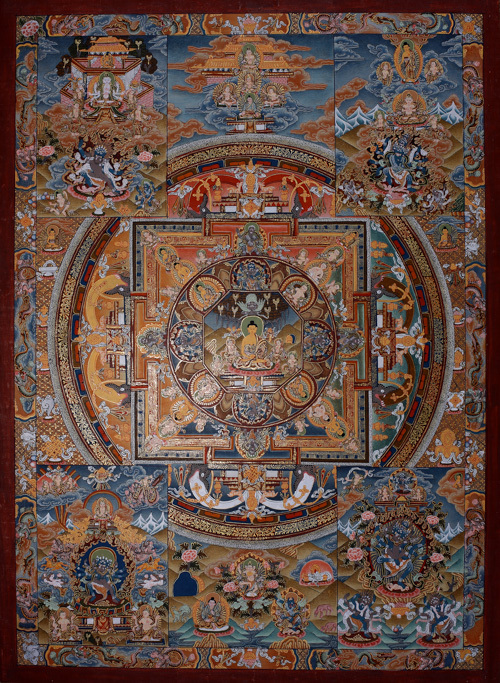 Dieses wunderschöne Buddha Mandala-Thangka zeigt neben dem Mandala selbst noch 4 weitere Gemälde in den Ecken des Thangkas. Sehr detailreiche und feinste Mandala-Thangka-Malerei. In dieses Stück sind 4 separate Gemälde integriert! A charming Buddha Mandala-thangka. There are still to see 4 more paintings in the corners of the thangka. Very highly detailed and finely painted thangka. With gold. In this Mandala-motif are 4 separate paintings integrated.